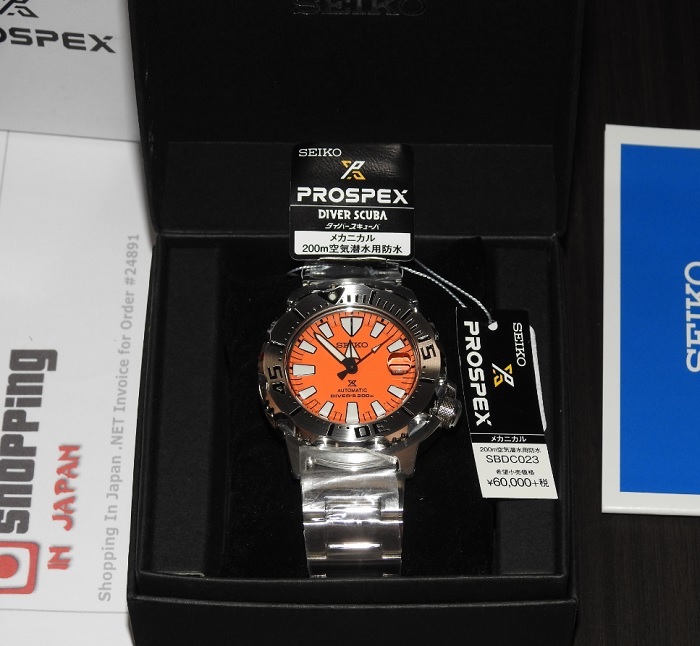 Clearance this rare Seiko Prospex Monster SBDC023 Orange Dial color that comes with 6R15 movement, Hardlex Glass, Rotating Bezel, Anti-magnetic, Screw-down crown, and fully made in Japan. Fantastic service by "Shopping in Japan"
Great watch, superb quality. Shipped immediately and delivered to UK very fast . Tracking number provided. Would recommend this shop for everyone for their professional service. Thanks again "Shopping in Japan ". This is a really well balanced diving watch for it's price. Handsome looking orange face/6R15 movement (automatic with self winding) with a 50 hour power reserve so you don't have to worry about it stopping as frequently as with movements that are automatic only/anti-magnetic which is important when around magnetic sources/great finish on the band, bezel and case and of course great for water sports. A watch that can be worn for any occasion without looking pretentious and it's made in Japan at the Seiko factory so you know it's made right. Часики мне понравились; точный ход, есть под завод в вечерние время хорошо светиться и просто красивые.